Brennan Heating & AC, Inc. is proud to serve the Murrayville community! About Murrayville, IL - Happy to be your hometown Heating & Air Conditioning Contractor! Murrayville will never be mistaken for a bustling metropolis and it is but a small dot on a map. However, it is a special place. With a populace of no more than 1,000 (probably closer to 600), it is small. However, it is within a quick drive’s distance to the state’s capitol of Springfield. Therefore, it provides the best of both worlds for residents– the quiet and tranquility of a small town and the amenities that a larger city offers. The weather is also the best of all worlds. With warm, or even scorching, summers and cold, often white, winters – it’s sunbathing in the summer and snowmen in the wintertime! If you are looking for some outdoor family fun, then Robinson Family Farm is a great place to get your farm fresh meats and enjoy pumpkin picking and more. Their year-round activities and events keep the farm hopping in every season. There’s also shopping, dining, a petting zoo, and much, much more. 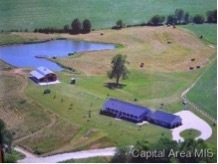 This picturesque farm also offers rentals for weddings and events. Within just miles of the Jim Edgar Panther Creek State Fish and Wildlife Area, the town is full of outdoor fun to be had. Nothing could be better than getting out and relishing in these natural wonders on a day. The history of the area is rich as its black soil. With vast areas of wild grassland, farmers settled this area centuries ago and agriculture is still the backbone of the community and the surrounding area. West Central Illinois is perhaps the most productive agricultural region on Earth. Seasonal weather means that those vast fields turn from jade to auburn to icy silver, gray and white. Each year, residents marvel as they look out of their peaceful town’s ever-changing landscape.